Nestled in Victoria's Uptown District, the historic Hudson's Bay building has been transformed into a modern and elegant 152 unit mixed use residential and retail space property. 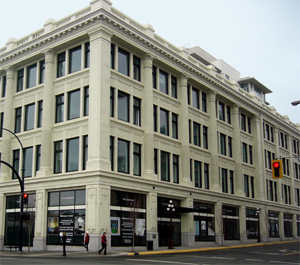 After 80 years of serving as a flagship retail location, this Victoria landmark has been re-invented as the Hudson and features energy efficiency programs such as geothermal energy exchange and optimized energy scavenging. Today the facility showcases sustainability and the material recycling, incorporating about half of the old structure within the design of the new one. The Hudson gracefully brings together old world elegance and infuses it with leading edge technological advances in building operation and efficiency. While maintaining its heritage essence, the heart of the building's mechanical and controls systems are technologically leading-edge. The facility boasts a modern parkade pollution detection system with multiple integrated sensors and synchronized supply, transfer and exhaust fans control for air ventilation and pollution relief. In addition, a comprehensive geothermal exchange system with energy efficient heat pumps and heat scavenging ability has been fully integrated within the water heating and cooling system. To further improve the ability to monitor and maintain the efficiency of the building's energy consumption, BTU energy meters have been installed at key points within the system. All these inter-dependent components had to be carefully linked together for best use of the building's energy options, and had to be presented in a cohesive manner that clearly visualized this inter-dependence to the building's operating staff. Modern System's BACnet™ network implementation provided a robust, flexible communication backbone for all areas of the building. ASHRAE standards compliant BACnet™ control devices connected to three distinct communication buses serve all areas of the building, with ample room for expansions and additions within the facility. Additional LonWorks® based BTU meters were easily incorporated within the controls system and integrated seamlessly in the graphical user interface. Detailed schematics outlining the complex geothermal water system, floor plans with locations of all parkade areas, as well as individual data archives for each sensor are just some of the features that round out a complete, Internet accessible controls system. Today, The Hudson is an eclectic mix of old and new. Historic exterior elements are combined with modern, exposed interior ceilings and contemporary design elements. Modern Systems provided a controls system that fits seamlessly within the building infrastructure, providing real-time access to monitoring and controlling the building's air and water systems. The all-encompassing user interface allows for clear overviews of sensors throughout the building and immediately alerts building operators of malfunctions or alarm conditions. Our robust BACnet™ and LonWorks® device networks combine to provide data from a variety of mechanical devices and monitoring points and a full range of data logging and trending tools offer invaluable information for fault-detection and energy efficiency management. The investment in this historic landmark is well protected into the future with solid, effective and standards compliant controls.